Short-chain acyl-CoA dehydrogenase deficiency (SCADD) is a mitochondrial fatty acid metabolism disorder, which results in the accumulation of butyrylcarnitine and ethylmalonic acid in blood and urine. Evidence of genotype/phenotype correlation and neuroimaging characteristics is limited compared with other inborn errors of metabolism. We report a male patient with SCADD who initially presented with seizures, metabolic acidosis, microcephaly, and developmental delay with gradual amelioration of most symptoms. 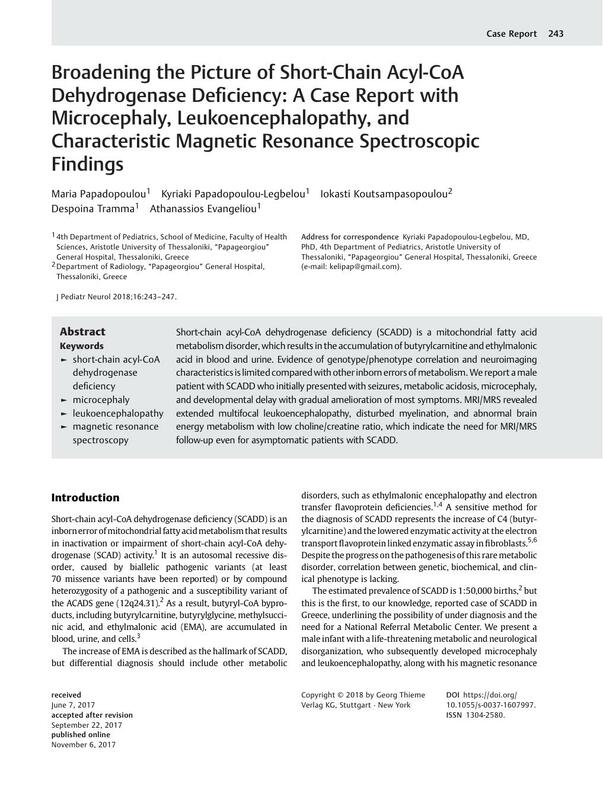 MRI/MRS revealed extended multifocal leukoencephalopathy, disturbed myelination, and abnormal brain energy metabolism with low choline/creatine ratio, which indicate the need for MRI/MRS follow-up even for asymptomatic patients with SCADD.